I joined TAW in 2002 within the Delta Force division. A fellow soldier and good friend (TANK) was part of TAW and during our deployment in Bosnia we played Delta Force Land Warrior on 4 laptops. Within DF I held nearly every position. We now have positions we then did not have. When i deployed in 2007 to Afghanistan I was away from TAW for a year, after that I rejoined. In the years that followed, I had numerous positions from Battlefield Commander to my current position as ALC. I enjoy being in TAW all those years. like to think of TAW as my online family. In real life I am currently a anesthesia assistant in training and before that i worked on a ICU/ MCU in a hospital. Before that I was in the Royal Dutch Army as medic with the rank of sergeant major before I left. I am happily married with my wife Monique and our 3 beautiful children Kaitlyn, Meaghan and Aedan. 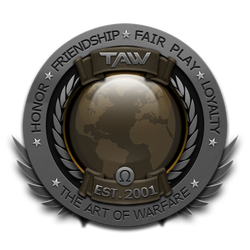 When I look at TAW and what it stands for it brings a smile to my face that we came from just 100-200 members to 2800. In all these years we have adapted things that came on our path and I have a true belief that we always will adapt to what comes on our path. I believe that in the next five years, with the dedication of all of our members, we will reach 5000 members. This thought that I have is that currently OS is working on making our new website, the influence of social media and the ability of TAW to adapt to all future changes within the gaming community. I really hope that one day we can successfully add console games to TAW and who knows, maybe even the games that we play on our smartphones and tablets.